People linked to the observed institutions recognize the problems that exist. They question the prison system as obsolete and permissive. 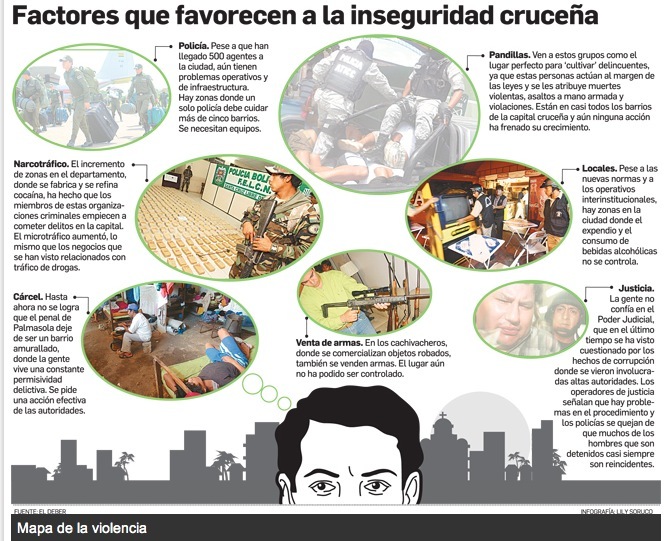 Experts consulted by EL DEBER coincide in pointing out that the capital of Santa Cruz presents seven factors that together increase the insecurity. The indicated aspects show the need for a structural change of the police, a judicial system that does not have credibility of population, a growth in remote neighborhoods gangs that is uncontrollable, an outdated prison system that does not comply with the rehabilitation of the inmates, the increase in drug trafficking in the capital and the provinces, the lack of control on the premises of retail sale of alcoholic beverages and the permissiveness of red zones where they sell objects of dubious origin and weapons. Before the points which are designated as ‘fuel’ for the growth of insecurity, the vowel of the departmental Court of Justice Alain Núñez recognizes that the local legal system does not respond to the needs of the population. “We are with a Judicial organ with ten years of backwardness. We must respond to the needs of the people. We are anachronistic and overdue,”said the Member with more than 15 years of service. He acknowledged that a judicial system is a sum of the insecurity factor and regretted that the institution is not independent. The national director of the special force of fight against drug trafficking (Felcn), Gonzalo Quezada, questioned the lack of credibility of the justice and claims by the permanent release of persons involved in criminal acts, without been judged and without fulfilling their sentences. Quezada asked to control young people involved in gangs, since it ensures that they are a breeding ground for future offenders. Prosecutor José Tarqui questioned the lack of control of youth and recognizes that in these irregular groups, drug use worsens their situation. For the President of the Pastoral Prison, Mabell López, Palmasola prison is a school for crime and laments that authorities intend no real action to modernise the penitentiary. “Children living with their parents in the criminal return as criminals. These young people become against the society”, she said. Henry Herrera, Attorney of the District of Santa Cruz, believes that the city’s growth was not accompanied by the increase of the entities that form part of the local institutional framework. Crime increased compared to last year, what is happening? We must not deny that Santa Cruz is not the same, it has suffered a disproportionate and excessive growth. That was not accompanied by the formal factors which the law has laid down within the framework of institutions, such as the police or the public prosecutor’s Office. We were with 96 attorneys for a population of almost 3 million inhabitants. Population grows, the problems grow, all have demands and needs. Perhaps our institutions have remained frozen in the 1990s. What factors do you think they contribute in this climate of insecurity? One of the problems is the prison system, is a system of effective control, given that from there, many violent acts are monitored. We are an obsolete jail, facing a Santa Cruz that has changed and grown. Immigration control must be strengthened, recent events show, unfortunately, the participation of at least a foreigner in all the violent acts. This entry was posted in Bolivia, Business, Crime and Violence, Drug war - narcotraffick, Economics, Health, Politics, Santa Cruz, Social Unrest, Tourism and tagged crime, Felcn, insecurity, police and judicial corruption, public safety. Bookmark the permalink.